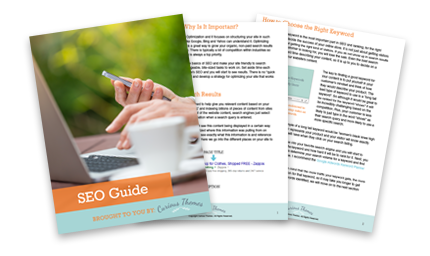 Download this FREE guide to learn how small but significant changes can improve your search rankings. Ready to learn how to dramatically transform your site rankings in the search engines and send more traffic to your site? Stop wasting your time! Learn the top ways to rank higher in Google. Help your potential customers find you faster online! You'll discover a proven process for optimizing your site so the search engines love you and send more traffic to your site. Search engine optimization can be confusing so we discuss some of the common Myths & Misunderstandings. This guide explains the top five places on your site to optimize for better rankings plus gives you step-by-step instructions on how to do it.